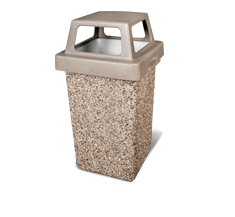 When it comes to selecting durable and reliable commercial trash cans and outdoor trash cans, consider The Park Catalog. According to the anti-litter organization, Keep America Beautiful, one of the big consequences of litter is that it encourages people to create more litter. To prevent this, use these strategies with trash receptacles and commercial trash cans. When users see an area that has trash strewn about, for some individuals this appears to give them the green light to go ahead and litter as well. One huge deterrent to this behavior is for site facility managers to increase the density of commercial trash cans in a given area. According to study conducted by the KAB of 130 public places, the littering rate was only 12% when a trash receptacle was 10 feet or closer. But the amount of people littering grew significantly when commercial garbage cans or outdoor trash cans were further away, increasing to about 30% when trash receptacles were a distance of 60 feet or more. Walt Disney reportedly conducted his own research into preventing litter at his parks and found the ideal distance was 25 feet to deter this bad habit. He was so obsessed with keeping his parks clean for families that he also created a system where outdoor trash cans were emptied from below, so you never witnessed a maintenance worker actually emptying a bin. One of the unfortunate issues that park and site facility managers face today is the fact that there is a tremendous variety of items available for consumers to discard. The most common type of trash found by the KAB was cigarette butts, followed by paper, food wrappers, candy such as gum, napkins, food remnants, beverage containers, food containers. 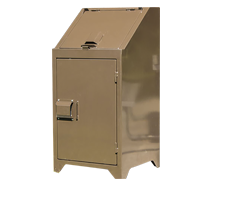 When placing outdoor commercial trash cans, it is critical that they are mounted in order to prevent theft and ensure stability against bad weather. 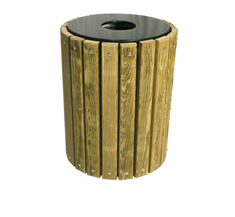 In-ground mounted commercial trash cans are used in places with softer ground surfaces such as grass and dirt. 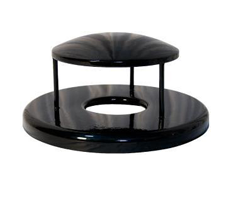 They are ideal for open spaces, parks, schools, sport fields, and courtyards. 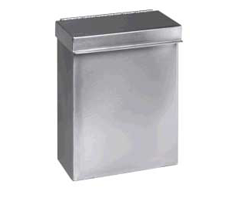 Surface-mounted commercial trash cans work better on solid surfaces such as sidewalks. 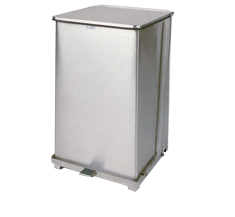 Smaller surface-mount commercial trash cans usually are mounted to a pole while larger surface-mount garbage cans are often connected at the base. 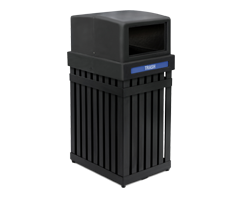 Because outdoor commercial trash cans are outside, they are susceptible to harsh weather and are typically made out of durable materials such as fiberglass, plastic, aluminum, steel and concrete. 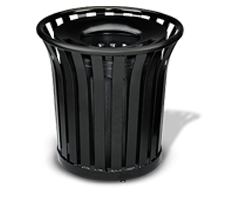 It is critical when setting up a commercial trash can that you choose the right material. For instance, if vandalism is an issue in your community, then a steel trash can works best. If you live in a wet area, then the best choices are recycled plastic, galvanized steel and stone aggregate because the moist atmosphere will not affect them. If the area is populated with a large number of animals, then lids should be used. Outdoor garbage cans can become quite messy when invaded by raccoons, bears or other creatures. 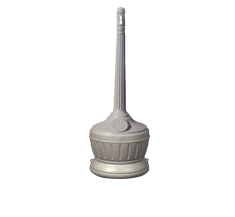 Next, it is important to place your commercial trash receptacles in heavily populated areas where litter will collect quickly and in clear sight. People should not have to search for a trash can. You should also place commercial trash cans in lesser populated areas such as parking lots and bathrooms. Also, it is crucial that your trash cans are large enough for your location. 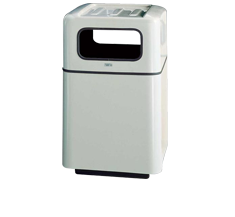 If there is a sizable number of people who frequent an area, then you should choose commercial trash cans with a larger capacity to hold excess garbage. Another point to keep in mind is that younger people tend to be litter bugs compared to older individuals. For example, in one study, it was found that adults 21-35 were THREE times more likely to throw their trash on the ground than those 50 and over and TWO times worse with this behavior than people 35-49. If your facility, shopping center, restaurant, hotel, school or park caters to the young crowd, it would be smart to be sure you have plenty of commercial garbage cans positioned strategically in the area. 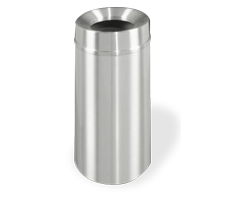 Some of our products are sturdy enough to be considered industrial trash cans for areas that require tough materials that can't be damaged or stolen. 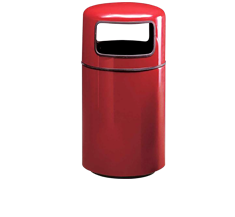 A smart choice is also to consider one of our logo commercial trash cans which enables you to promote your brand to visitors which in turn increases their sense of pride for the area. 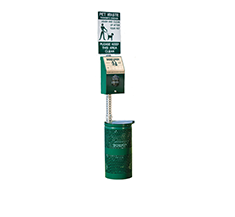 Or you can include an anti-litter message or green campaign for your park or outdoor venue with recycling receptacles. Another option is to buy a “creature” commercial trash can with a cartoon-like appearance. People are drawn to decorative trash cans. Hopefully this will encourage people to dispose their trash in the receptacle and not on the ground. For the most part, people of all ages find trash an eyesore. Litter in an area is unhealthy, unappealing, attracts rodents and other pests and creates an unpleasant experience. Studies show adding the right number of commercial trash cans to your environment makes a big difference. This best practice will create the positive image you want to foster for your facility. 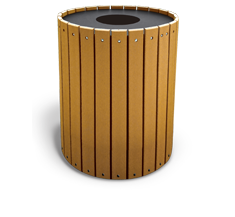 At The Park Catalog we offer a tremendous selection of trash receptacles and commercial trash cans. These are all top-quality heavy-duty garbage containers. You can find products manufactured with recycled plastic, metal, fiberglass, concrete, aggregate stone, aluminum or wood. Consider "going green" and adding recycling receptacles. Whatever your needs, both indoor and outdoors, our expert representatives will help you choose the right commercial trash receptacles for your facility. On a deadline and need commercial trash cans right away? With our ParkExpress program we stockpile our top-selling commercial garbage cans and other trash receptacles in our warehouse so we can quick ship these items in just 1-3 days.